Rather than buying costly binoculars for observing astronomical phenomena, most of us feel more than contented to do that through our TV sets or space websites. Avid stargazers, however, would do anything to catch the slightest glimpse of that star-filled galaxy. 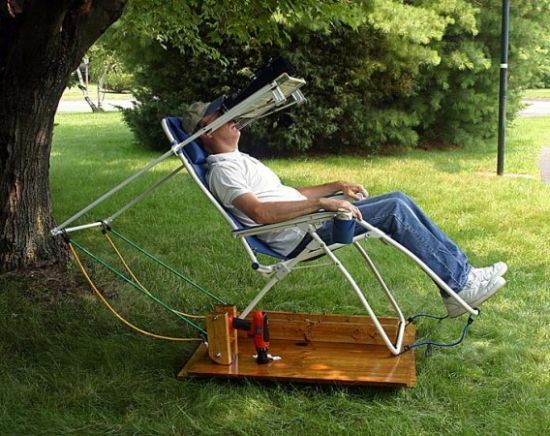 Gary Honis belongs to the latter category as he has created a motorized stargazing chair with high-power binoculars installed in ‘the user’s line of sight’. Gary utilizes a chain from an old bicycle and cogs to create the base of his motorized contraption. The machine flaunts a power drill to avoid overshooting and make elevation of the binoculars fully adjustable. The amazing hack also utilizes a discarded ice cream maker, which goes on to refine the rotating setup.